That’s the view of NBA insider Colin Cowherd. Williamson and Duke are currently preparing for March Madness, with Mike Krzyzewski’s side the No 1 seed. However, the Duke star, 18, is set to declare for the NBA draft this summer – with many expecting Williamson to be the No 1 pick. Williamson’s Duke team-mate RJ Barrett has also been backed to be taken first, with the pair set to battle it out this summer. Williamson has been compared to Los Angeles Lakers superstar LeBron James, with the forward’s athleticism making him almost impossible to guard. James and Williamson were dominating headlines this week after ex-Boston Celtics star Paul Pierce claimed the Lakers should trade James for Williamson if they get the No 1 pick. “If the Lakers got the number one pick, I would trade LeBron James,” Pierce said to ESPN. However, Fox Sports’ NBA expert Cowherd has hit back at Pierce, claiming James would be the perfect team-mate for Williamson. Cowherd added Golden State Warriors superstar Curry would be ideal for Williamson, however, the likes of Kevin Durant, Kyrie Irving and Kawhi Leonard wouldn’t help the youngster. “I didn’t think this was a great year for LeBron as a leader,” Cowherd said on Fox Sports’ The Herd. “There was a lot going on. I thought he was a little distracted. It was a bad year. 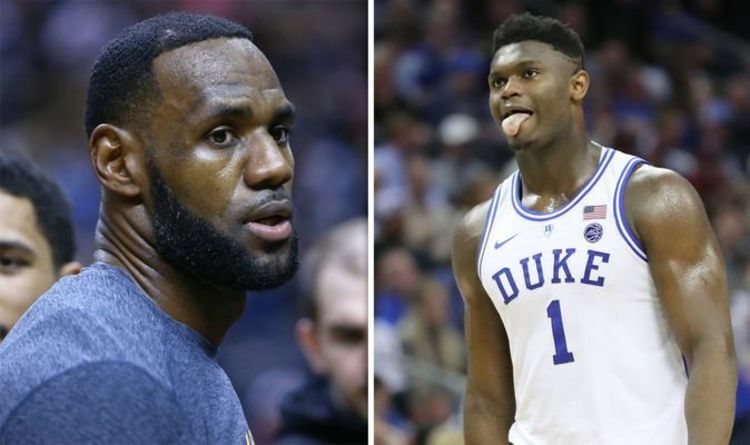 “But if you told me there’s an NBA star that will play with Zion for the first three years of his career, I’d pick LeBron. “Smart guy, knows the league, came in with the same hype.